When we found out that there was plans to make a Godzilla vs. King Kong movie, many wondered how Kong would stand a chance against Godzilla considering how insanely big the lizard was in the 2014 reboot. Clearly Kong was going to need a big size boost if they were going to make it interesting. Then last month the size of the new Kong in the upcoming Kong: Skull Island was revealed to be around 100 feet. Though much bigger than the usual 25 to 50 feet, it was still nowhere Godzilla’s 350+ feet. Whether Godzilla vs. King Kong will ever get made is unknown. 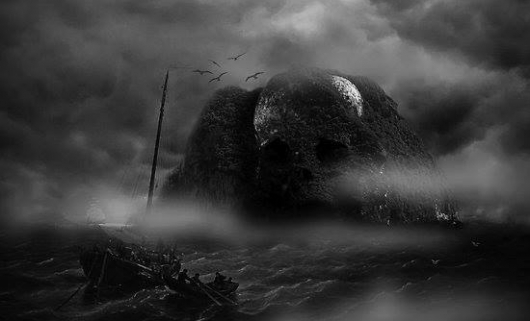 But for today we have the first official Skull Island image, and it offers an idea of just how huge Kong might be. It’s one thing for someone to say 100 feet. It’s another thing entirely to actually see what it might look like. Check out the image below. 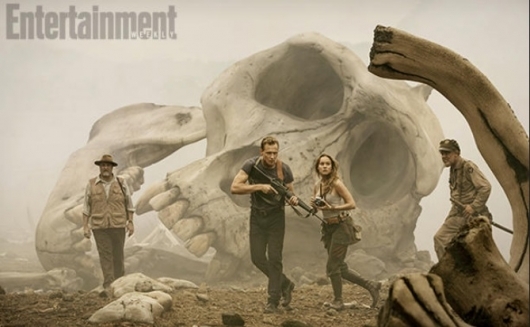 As you can see in the image, stars Tom Hiddleston and Brie Larson stand in front of a skull. One of the skulls that give the island its name. And it is large. Of course this is not Kong, so he could be even bigger or maybe even smaller than this. But it does give us a good idea around how massive the beast will be. “From the size of the skull, you can tell that things on this island are much bigger than audiences are used to with traditional Kong lore. Our Kong is by far the biggest Kong that you’ve seen on screen, and that translates to a lot of different things on the island. Interestingly enough, it’s not clear whether making Kong so big was partly due to his planned battle with Godzilla. Likely because if Skull Island doesn’t do well future movies in the monster shared universe still might not happen. Time will tell. For now, enjoy the skull of a god.